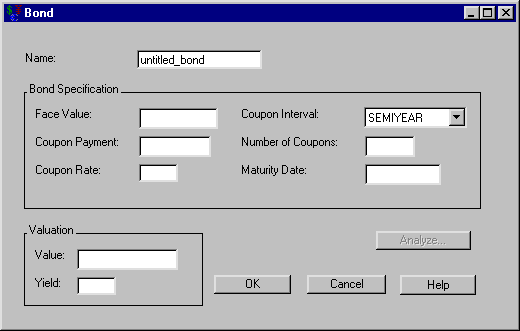 Selecting Investment New Bond from the Investment Analysis dialog box’s menu bar opens the Bond dialog box displayed in Figure 56.31. Name holds the name you assign to the bond. You can set the name here or within the Portfolio area of the Investment Analysis dialog box. This must be a valid SAS name. Face Value holds the bond’s value at maturity. Coupon Payment holds the amount of money you receive periodically as the bond matures. Coupon Rate holds the rate (a nominal percentage between 0% and 120%) of the Face Value that defines the Coupon Payment. Coupon Interval holds how often the bond pays its coupons. Number of Coupons holds the number of coupons before maturity. Maturity Date holds the SAS date when you can redeem the bond for its Face Value. The Valuation area becomes available when you adequately define the bond within the Bond Specification area. Entering either the Value or the Yield causes the calculation of the other. If you respecify the bond after performing a calculation here, you must reenter the Value or Yield value to update the calculation. Value holds the bond’s value if expecting the specified Yield. Yield holds the bond’s yield if the bond is valued at the amount of Value. You must specify the bond before analyzing it. After you have specified the bond, clicking Analyze opens the Bond Analysis dialog box where you can compare various values and yields. OK returns you to the Investment Analysis dialog box. If this is a new bond specification, clicking OK appends the current bond specification to the portfolio. If this is an existing bond specification, clicking OK returns the altered bond specification to the portfolio. Cancel returns you to the Investment Analysis dialog box. If this is a new bond specification, clicking Cancel discards the current bond specification. If this is an existing bond specification, clicking Cancel discards the current changes.